You know that data drive Daredevil has in his possession as of Daredevil #6? 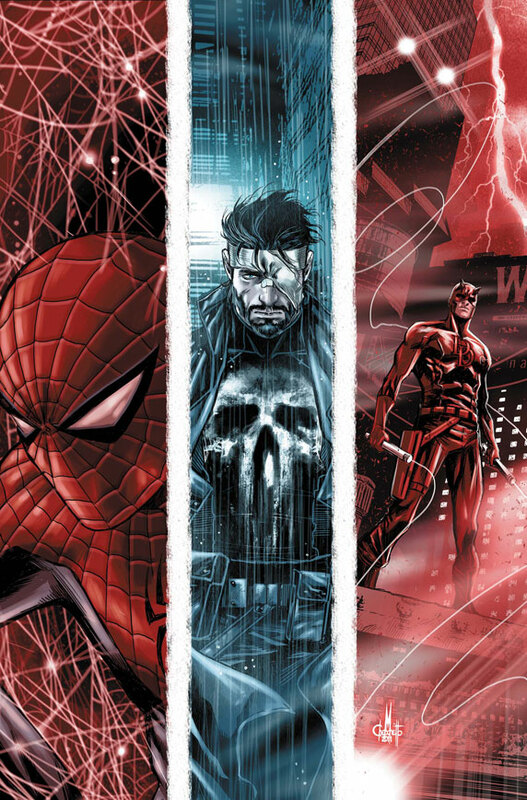 Well, the plot thread will be resolved in a cross-over happening this April between Daredevil, Avenging Spider-Man and The Punisher. Considering the wonderful start the current cross-over between Daredevil and Amazing Spider-Man got off to this week (I’ll review it over the weekend), this looks like it’s going to be a real thrill. The story kicks off in Avenging Spider-Man which will be co-written by Mark Waid and Punisher writer Greg Rucka. They will then each go on to write the issues of their own titles. The art for all three titles will be by regular Punisher (and former Daredevil) artist Marco Checchetto. I really like his art and am perfectly fine seeing Paolo Rivera take a break for Daredevil #11. More info on this very cool piece of news can be found on CBR. You can also check out the liveblog itself on Marvel.com! Should DD be part of the large Marvel events? Not necessarily, but this represents the perfect type of ‘event’ for him. Self-contained yet with possible far-reaching implications for the MU and associated with more street-level characters & concerns. Rucka & Waid & Checchetto, Frank & Matt with Peter thrown into the mix, this sounds like a load of fun. I thought the role Abigail Brand played in ‘Secret Invasion’ was an ideal model for Daredevil’s involvement with the big events. She got on board the Skrull ship and freed Mr. Fantastic. A vital role once you know about it, but one you didn’t need to know about to enjoy the event proper and not something which took the character out of their comfort level. About the team-up : it’s a kind of return to the 70-80s, when DD and Spidey had many team-ups. One of the best I remember is the Death of Jean De Wolf.